It was a cold 28 degrees when we got up early around 6:30/7 to get ready to head down the mountain for the 3.5 hour drive what was ahead. Why drive that far? Well, I had been pretty much convinced, via the internet and a phone call, that we had found “the one”. My gut told me otherwise, “it’s too cheap to be in good condition! The guy on the phone did say sold as is, that is never good”. Rodney was also wanting, just as much as me, for this to be the trailer. What a steal it would be! So, on we went. When we got to the end of the county road we saw the next shift of fire fighters headed to fight the Junkins Fire which is not far from where my parents live. Talk about reality check. But more on that in a bit. Fast forward 3.5 hours later. We arrive at Century RV in Longmont, Colorado. One thing I have figured out at RV dealerships, is that you don’t seem to be immediately swamped by salesmen… although two showed up once we walked up to the office. I asked for Eddy, the man I had been speaking to on the phone. He was neither of these guys. Off to find Eddy. Eddy seemed surprised to see us, even though he knew we were on our way. (insert squinty eyed emoji here) We loaded up into two golf carts to go out to the lot where this unicorn, cheap, perfect enough trailer was sitting. We drove past a row of very well taken care of used trailers. And then another. And then another. And then we went through an open gate into another lot, of…well, less than well taken care of trailers. And we drove past those. I started to worry. I don’t know what Rodney was thinking, since we were sitting back to back on the golf cart. But he probably had worry in his eyes. I’m sure mom and dad, in the second golf cart, were already shaking their heads. We arrived in front of this Jayco fifth wheel, that on the website looked pretty great. It was not the same thing… but you know… cosmetics right? You can always fix that. Eddy opens the door. A smell hits you. Not a good one. We go in the door. The first thing I noticed was the amazingly dirty floor, and then… I looked up. The entire ceiling was sagging and falling. It had been water damaged badly. Somehow, this was not in the pictures. I have no idea how it wasn’t. I have no idea why Eddy would say over the phone that the only problem was trim falling off due to someone “pulling on it”. Once he realized we were not going to buy it. He pawned us off on the other sales man. We proceeded to see like 5 more trailers with water damage, all going up in price. It was bizarre. We left for lunch. 2 hours away. After I got over the major disappointment and self anger, because seriously I should have known better… we all laughed the rest of the way home about how cousin Eddy tried to tell us that the moldy sagging ceiling was not water damage. Wyatt was doing great! Long drive, he took a short nap and played with his dinosaurs and trucks the rest of the way. He was too good. We stopped at Cracker Barrel. You’ve been there right? Remeber what they have when you walk in the door? Right, toys and candy. We had a minor disagreement headed to the table about a ridiculous minion fan. Narrowly avoided disaster by coming to the agreement that the child would eat his lunch first, where afterwards we would re-evaluate the toy buying options. I felt pretty great about my ability to negotiate with my toddler. Error one. We sit down, ready for some home cooking and family bonding. Wyatt imediately put all those little pegs in his mouth to pretend like he was playing a trumpet. Clever. But gross. Try explaining germs from other people to a 2.5 year old who was trapped in a truck for over 4 hours. Error two. Went to the bathroom, he insisted on joining me. We have to walk past the toy in question. We have to re-negotiate the terms of the aggreement. Error three. Once the food came, the toddler no longer wanted the food he picked out. Of course. So we proceded to fight over him eating and sitting on his bottom, until I had to make good on my threat. I may or may not have threatened to throw all the dinosaur toys away and make him sit in the truck with me instead of enjoy lunch with the family. I snatched him up from the table and walked him outside. Once outside, he pleaded and begged to go back. But I walked him all the way to the truck. Showed him the trash can and we talked about throwing dinosaurs away. He was very sad. He didn’t cry, but was very sad. I said he could have one more chance. Especailly since I didn’t have the keys to the truck and I’m not actually about to throw away his toys. We paid money for those! He sat down and pouted. And only ate when papaw finished his food and let Wyatt sit on his lap and eat his lunch. But hey, at least he ate. Win? Maybe? We stopped at one more dealership, where the sales team never even bothered coming outside. When Rodney went in they told him just drive around and look at them and let us know…. you can imagine how that turned out. On the way back up the mountain we got to see more of the fire. Or I guess the smoke from the fire. It was oddly beautiful and very scary. Can you imagine being a firefighter? It takes a certain type of brave to be a fireman. Thank God for them. They run in when we run out. The fire is contained 70% last I checked online. Hug a firefighter. All in all, it was a good day. 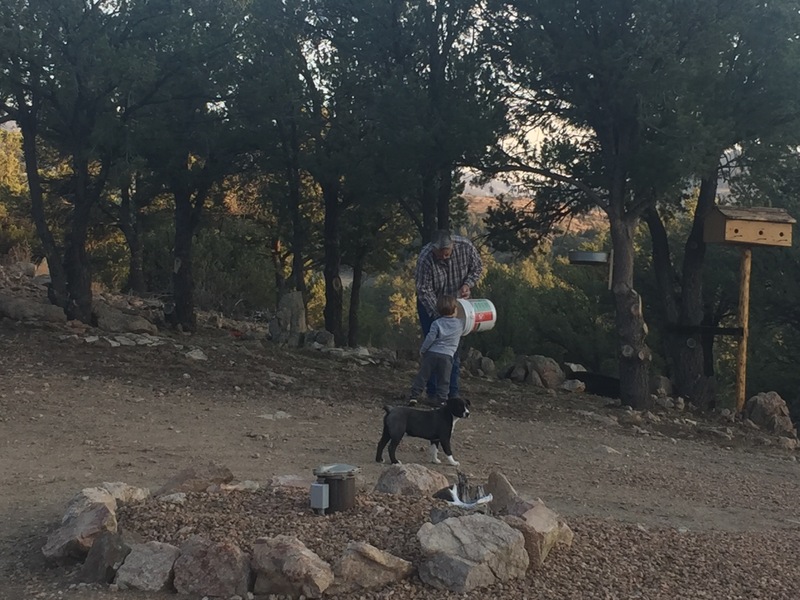 We ended it with Wyatt helping my dad feed the deer, chipmunks and birds. Dad is getting a fire going. It’s 40 degrees on the mountain. All is calm. Previous To Capsule or Not to Capsule…. Is that the Question?